RONG XIANG is a work on architectural replicas, piracy and its political consequences. It is a comparison of LeCorbusier's chapel Notre Dame Du Haut in Ronchamp, France with its exact replica in Zhengzhou, Henan province East China. The work further compares LeCorbusier's human-scale informed "Modulor" concept with ancient Tao philosophy of Confucius and master builders of the Han dynasty. 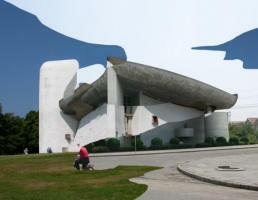 The Ronchamp replica in Zhengzhou is now a legend - it was short lived, erected in 1994 and demolished in 2006 after a three year lasting dispute with the "Foundation LeCorbusier" in Paris.